Source: W. J. Birkbeck, et al., eds., The English Hymnal (London: Oxford University Press, 1906), #8, pp. 12-13. 1. O come, O come, Emmanuel! Far from the face of God's dear Son. 3. O come, O come, thou Dayspring bright! 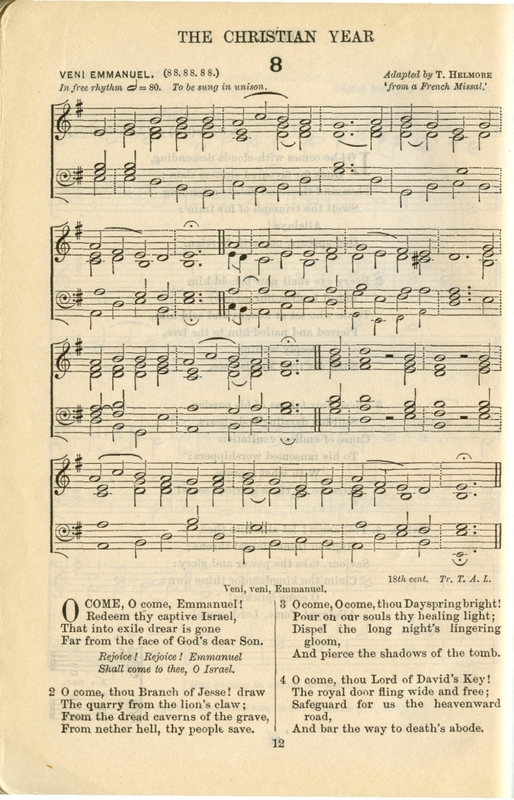 Sheet Music "Veni Emmanuel" "Adapted by Thomas Helmore from a French Missal" From W. J. Birkbeck, et al., eds., The English Hymnal. London: Oxford University Press, 1906, #8. Also found in Percy Dearmer, R. Vaughan Williams, and Martin Shaw, eds., Songs Of Praise. London: Oxford University Press, 1931, #66. 2. O come, thou Wisdom from on high! These two verses correspond to original verses 1 and 6 of "Veni, Veni, Emmanuel." They give attribution to T. A. Lacey and "the compilers."